For the film, see The Yellow Sea (film). The Yellow Sea is located between China and Korea. The name is given to the northern part of the East China Sea, which is a marginal sea of the Pacific Ocean. It is located between mainland China and the Korean Peninsula. Its name comes from the sand particles from Gobi Desert sand storms that turn the surface of the water golden yellow. The Yellow Sea is one of four seas named after common colour terms — the others being the Black Sea, the Red Sea and the White Sea. Since 1 November 2018, the Yellow Sea has also served as the location of "peace zones" between North and South Korea. The Yellow Sea is separated from the Sea of Japan by the boundary from the southern end of Haenam Peninsula in Jeollanamdo to Jeju Island and divided into the East China Sea by the boundary from the west end of Jeju Island to the Yangtze River estuary. The Yellow Sea, excluding the Bohai, extends by about 960 km (600 mi) from north to south and about 700 km (430 mi) from east to west; it has an area of about 380,000 km2 (150,000 sq mi) and the volume of about 17,000 km3 (4,100 cu mi). Its depth is only 44 m (144 ft) on average, with a maximum of 152 m (499 ft). The sea is a flooded section of continental shelf that formed after the last ice age (some 10,000 years ago) as sea levels rose 120 m (390 ft) to their current levels. The depth gradually increases from north to south. The sea bottom and shores are dominated by sand and silt brought by the rivers through the Bohai Sea (Liao River, Yellow River, Hai He) and the Korea Bay (Yalu River). Those deposits, together with sand storms are responsible for the yellow water color and the sea name. The tide-related sea level variations result in a land pass 2.9 km (1.8 mi) long and 10–40 meters (33–131 ft) wide opening for approximately an hour between Jindo and Modo islands. The event occurs about twice a year, at the beginning of May and in the middle of June. It had long been celebrated in a local festival called "Jindo Sea Parting Festival", but was largely unknown to the world until 1975, when the French ambassador Pierre Randi described the phenomenon in a French newspaper. The sea is rich in seaweed (predominantly kelp, Laminaria japonica), cephalopods, crustaceans, shellfishes, clams, and especially in blue-green algae which bloom in summer and contribute to the water color (see image above). For example, the seaweed production in the area was as high as 1.5 million tonnes in 1979 for China alone. The abundance of all those species increases toward the south and indicates high sea productivity that accounts for the large fish production in the sea. Newer species of goby fish was also discovered. Oceanic megafaunas'bio-diversities, such as of marine mammals, sea turtles, and larger fish drastically decreased in modern time not only by pollution but also mainly by direct hunting, most extensively Japanese industrial whaling, illegal mass operations by Soviet with supports from Japan. and fewer species survived to today although being still in serious perils. Those include spotted seals, and cetaceans such as minke whales, killer whales, false killer whales, and finless porpoises, but nonetheless all the remnants of species listed could be in very small numbers. Historically, large whales were very abundant either for summering and wintering in the Yellow and Bohai Seas. For example, a unique population of resident fin whales and gray whales were historically presented, or possibly hosted some North Pacific right whales and Humpback whales (3 whales including a cow calf pair was observed at Changhai County in 2015) year-round other than migrating individuals, and many other migratory species such as Baird's beaked whales. Even blue whales, Japanese sea lions, dugongs (in southern regions only), and leatherback turtles used to breed or migrate into Yellow and Bohai seas. Spotted seals are only species thriving in today's Yellow sea and being the only resident species as well. A sanctuary for these seals is situated at Baengnyeongdo which is also known for local finless porpoises. Great white sharks have been spotted to prey on seals in these areas as well. The coasts of the Yellow Sea are very densely populated, at approximately 250 inhabitants per square kilometer (650/sq mi). The sea waters had been used for fishing by the Chinese, Korean and Japanese ships for centuries. Especially rich in fish are the bottom layers. About 200 fish species are exploited commercially, especially sea bream, croakers, lizard fishes, prawns, cutlassfish, horse mackerel, squid, eel, filefish, Pacific herring, chub mackerel, flounder and jellyfish. The intensity of fishing has been gradually increasing for China and Korea and decreasing for Japan. For example, the production volumes for China rose from 619,000 tonnes in 1985 to 1,984,400 tonnes in 1996. All species are overfished, however, and while the total catchments are rising, the fish population is continuously declining for most species. 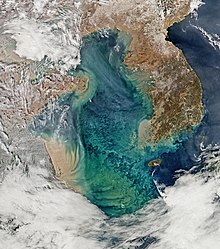 The Yellow Sea is considered among the most degraded marine areas on earth. Loss of natural coastal habitats due to land reclamation has resulted in the destruction of more than 60% of tidal wetlands around the Yellow Sea coastline in approximately 50 years. Rapid coastal development for agriculture, aquaculture and industrial development are considered the primary drivers of coastal destruction in the region. This degree of loss of area, widespread pollution, algal blooms and declines of invertebrate and vertebrate fauna have resulted in the classification of this ecosystem as endangered. The tidal flats of the Yellow Sea are considered Endangered. ^ a b "Koreas halt all 'hostile' military acts near border". November 2018. ^ "Limits of Oceans and Seas" (PDF) (3rd ed.). International Hydrographic Organization. 1953. Retrieved 7 February 2010. ^ esa. "Earth from Space: The Yellow Sea of China". ^ Barter, M.A. (2005). Yellow Sea – driven priorities for Australian shorebird researchers. pp. 158–160 in: "Status and Conservation of Shorebirds in the East Asian – Australasian Flyway". Proceedings of the Australasian Shorebird Conference, 13–15 December 2003, Canberra, Australia. International Wader Studies 17. Sydney. ^ Weller, D.; et al. (2002). "The western gray whale: a review of past exploitation, current status and potential threats". 4 (1). J. Cetacean Res. Manage: 7–12. Retrieved 10 March 2016. ^ Berzin A.; Ivashchenko V.Y. ; Clapham J.P.; Brownell L. R.Jr. (2008). "The Truth About Soviet Whaling: A Memoir" (PDF). DigitalCommons@University of Nebraska - Lincoln. Retrieved 10 March 2016. ^ Monsarrat Sophie (2016). "A spatially explicit estimate of the prewhaling abundance of the endangered North Atlantic right whale". Conservation Biology. 30 (4): 783–791. doi:10.1111/cobi.12664. PMID 26632250. ^ Huogen W.; Yu W. (1998). "A Baird's Beaked Whale From the East China Sea". Fisheries Science, 1998-05: CNKI – The China National Knowledge Infrastructure. Retrieved 7 September 2015. ^ "백령도 어부들의 친구 쇠돌고래". ^ "백상아리, 백령도서 물범 공격장면 국내 첫 포착 - 민중의소리". ^ AFP, Agence France-Presse (22 November 2016). "China's jellyfish-hauling mules a dying breed". www.atimes.com. Retrieved 2 December 2016. ^ a b c UNDP/GEF. (2007) The Yellow Sea: Analysis of Environmental Status and Trends. p. 408, Ansan, Republic of Korea. ^ a b Murray, Nicholas J.; Ma, Zhijun; Fuller, Richard A. (2015). "Tidal flats of the Yellow Sea: A review of ecosystem status and anthropogenic threats". Austral Ecology. 40 (4): 472–481. doi:10.1111/aec.12211. ISSN 1442-9985. ^ "China's largest algal bloom turns the Yellow Sea green". The Guardian.